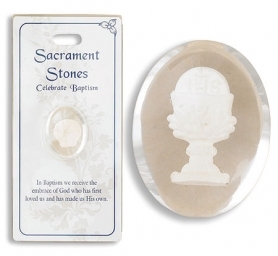 Find strength and healing in our new line of Patron Saints of Healing Pocket Stones. Each man-made acrylic 'stone' is sized to fit comfortably in the palm of your hand, contains a silver patron saint medal inside and comes packaged on a healing verse card. They are the perfect inspirational token for those who are ailing and make great gifts for those in need of peace and comfort. 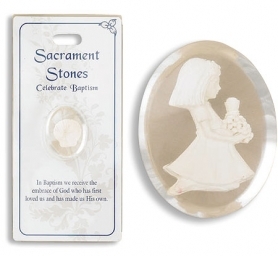 Please note that these items are not meant to be superstitiously used and are not 'good luck' tokens - you should have your medal or pocket stone blessed by a Catholic priest to make it a true sacramental of the Church.The tokens and medals are meant to be used in conjunction with prayer and faith. The honoring of saints began within the first generations of the Catholic Church. In early tradition, it was the martyrs who were remembered. The early martyrs were men and women whose Christianity brought them into friction within Jewish and pagan communities and eventually led to their executions. Altars were erected on top of the tombs of these martyrs, where Mass would be said, especially on the anniversary of the martyr’s death. In time, when permanent churches were able to be built, chapels and eventually basilicas were built on top the resting places of the martyrs. In time, others were honored as well.